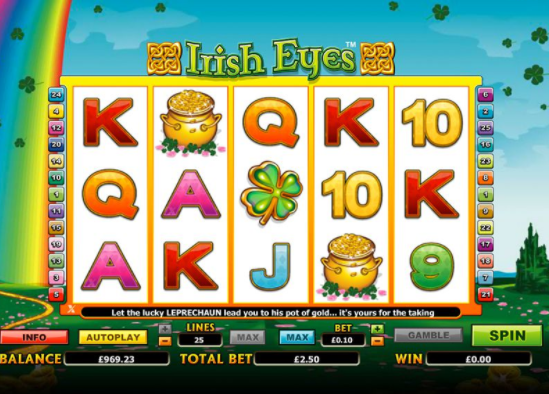 The luck of the Irish will be with you when you play Irish Eyes slots online. It's time to put on your greenest of clothes, maybe even a top hat, if you happen to have one and search for the magical rainbow as you join this auburn Irish lassie on a journey through this Celtic, themed 5 reels and uncover shamrocks, tribal tokens and leprechaun hats on your quest for free spins and pots of gold. More Easy slot promotions, please visit https://www.easyslots.com. 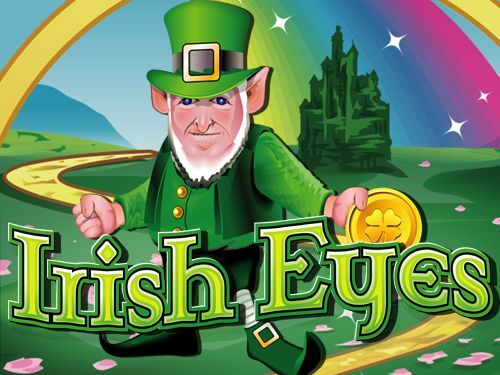 Play the Irish Eyes Slot Game today! A pint of Guinness, sir? For that, head to your nearest bar, but for almost everything else you normally associate with Ireland – head to NextGen’s 5 reels, 25 pay line online slot game. From £0.01 to £50.00 per spins, we can enjoy gaming with all the colours of the rainbow – plus a substantial pot of gold tucked away at its end. Irish eyes is a vibrant, visually gleaming game full of bonus features, character, and Irish charm. It involves playing card symbols 9 through Ace, that rarest of lawn leaves - the Four Leaf Clover, the aforementioned Pot o’ Gold, and a picaresque golden County Path, winding its way to the end of the rainbow. For more information about casino, visit here! A cheeky Irish Leprechaun is the Wild of the game and will substitute every other symbol apart from the Scatter – a crimson-haired, emerald-isle-green-eyed, Irish Beauty. She is the key to an extravagant 12 Free Spins. Three or more of her and we’re off - and we’ll often find that the Free Spins can be retriggered. 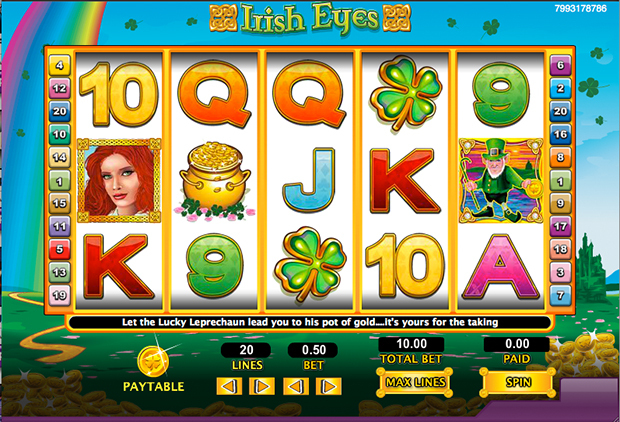 During both the Free Spins and the Base Game, if we land the little Irish Leprechaun on reels 1 and 5, we’ll find ourselves in a quick mini-game of choice. The prizes on offer in the mini-game are coins, multipliers, and even the chance to get more picks within the mini-game! Along with these cool bonuses, there’s also a Gamble Feature, which can be activated after any win. This is a suit or card colour guessing game, which can either double or quadruple the initial win. The most impressive win of the game is the Jackpot. A massive 10,000 coin bonus for the lucky traveller who comes to Irish Eyes and finds 5 Leprechauns on one pay line – this may just be the Pot of Gold we’ve been waiting for! Graphically, Irish Eyes isn’t fantastic, but it certainly gets the theme spot on – and lacks nothing in playability. The audio is catchy enough to keep the game fun, and with the regularity with which the Wilds appear on the reels, there is an enticing number of equally consistent wins awaiting. NextGen certainly know how to make a rainbow – the giant stream of vibrant colour coming out of the setting of Irish Eyes looks like it goes on forever! Thankfully though, it doesn’t, and the pot of gold we’ve come for is never far away. Irish Eyes might not be the most graphically amazing game we’ve ever come across, but it never has to be anything else, as the spins and wins are certainly splendid! 8/10 from Easy Slots. Why not take a break from slots and discover more games at EasySlots.com.